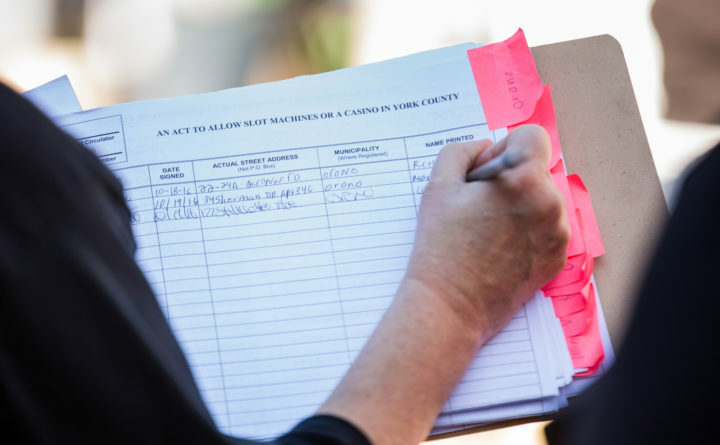 In this file photo, a person signs a petition related to the 2017 York County casino referendum question, which voters did not approve. The backers of the failed 2017 referendum to create a York County casino have legally challenged a record-breaking fine against them for violating Maine’s campaign finance laws. The suit, filed Monday in Kennebec County Superior Court by casino backer Lisa Scott, argues that she reported contributions to her campaign according to advice she was given by the Maine Ethics Commission, which later fined four political committees she was involved with a total of $500,000. Paul Lavin, assistant director of the Maine Ethics Commission, said Tuesday he couldn’t comment because of the pending litigation. The penalty, which shattered the record for a fine levied by the Maine campaign watchdog agency, came after a months-long investigation that revealed the source of $4.6 million in funds spent supporting the referendum had been improperly reported. Specifically, Scott argues that the fine should be lower because she reported the amount of the contributions, with the exception of $115,000 she acknowledges she reported late, but just not the source. The suit alleges the commission’s process was “tainted by an appearance of bias” against Scott and that the penalty was “unconstitutionally excessive” and out of scale compared to past penalties levied by the commission. Lisa Scott, who was involved with all four committees before quitting the campaign in August 2017, originally reported she had donated the money but later acknowledged it came from a Japanese firm and a company owned by her brother, Shawn Scott. That company, Capital Seven LLC, would have had sole rights to operate the casino if last year’s referendum had passed. It failed, with 83 percent of voters opposing it. Lawyers for Scott said during ethics commission proceedings that they would appeal the decision. Among other complaints they listed was that Scott and her associates did not receive due process and that the commission levied its fine just four days before Election Day. Technically, the fines were levied for late reporting of campaign finance activity.